This book captures the stories of five doctors who have killed their patients, including, Harold Shipman, Marcel Petiot, Michael Swango, H.H. Holmes, and John Bodkin Adams. It is amazing that these people chose a profession to help save lives, but preferred to kill. Is it not their job to curtail suffering and death? We sometimes put our lives in the hands of doctors, trusting that our best interests are the most important to them. Thankfully, there are only a handful of doctors who have been inclined to murder their patients, and they do not represent the millions of doctors who genuinely care and uphold their oath. A somewhat weird, creepy, disturbing and unusual collection of stories about doctors who killed. These doctors became serial killers, mainly in their practices as they killed dozens and sometimes even more than 100 patients each that we are aware of. The author goes into a great deal of detail about the typical characteristics and personalities of serial killers, and what makes them kill. That is very little comfort for anyone reading these stories, but it does help a little bit to understand to understand the basic profile of serial killers. This book probably is not for the faint of heart, but it is interesting nonetheless. Would you ever listen to anything by RJ Parker again? For someone facinated with serial killers, one could be forgiven for believing that this set of case studies are for you - they arent! Beth MacEwan's slow drawl and constant mistakes demonstrate the non-existant budget for the recording. Back ground noise can be clearly heard with the creaking of a chair and something that sounds remarkably like another person.Put this altogether and you have a waste of money and/or credit. I would suspect that RJ Parker would be very disappointed!!! Would you try another book from RJ Parker and/or Beth MacEwan? This book Sucked. The stories were bad and the narrator could not have been worse. Save your time and money. I found listening to this book very hard until i turned the speed up. The woman who read this book often mispronounced words, coughs, stammers and leaves large gaps. She also sounds like she is in a tinny room without any proper equipment. I like these kind of books but this is so hard to listen until I realised I could turn up the speed this lady wrote which then made this book much easier to listen to as it sorted all the above issues out. 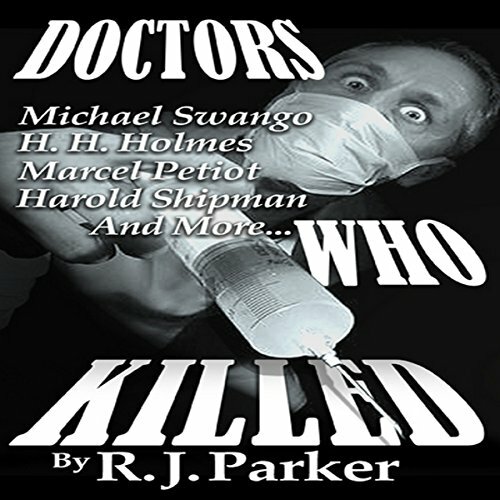 Where does Doctors Who Killed rank among all the audiobooks you’ve listened to so far? Have you listened to any of Beth MacEwan’s other performances? How does this one compare?